Anna Brody (b. 1991) is a photographer from Washington D.C. who will be graduating this year (2017) with her BFA in Photography from the Savannah College of Art and Design in Georgia. Her work focuses primarily on longing, loneliness, contentment, cyclical mood shifts, and escapism, all as represented by or found within the social and built landscape. She also likes to take pictures of other people whose feelings she can see out loud. Since 2014 Anna has been an editorial assistant with Aint-Bad, an independent publisher of new photographic art. 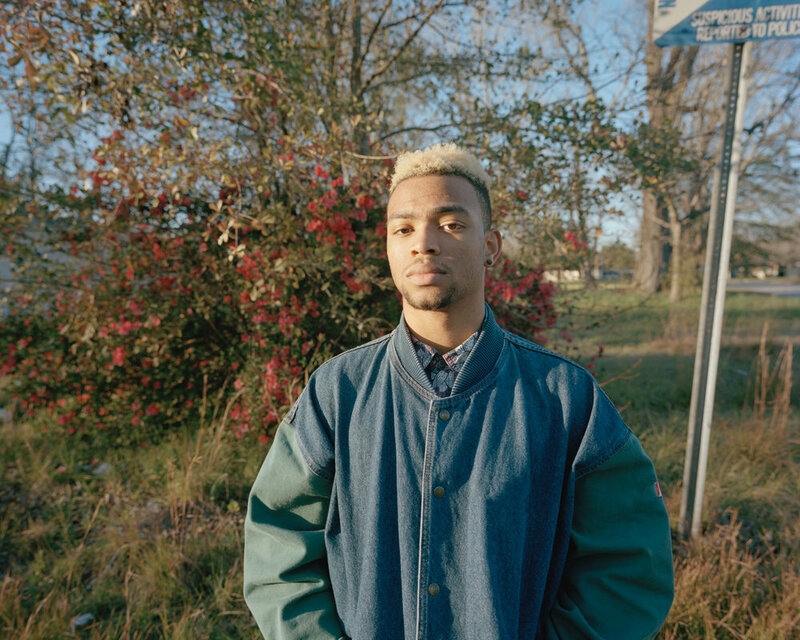 Her work has been shown in exhibitions throughout the U.S., and her ongoing series Edging, GA was most recently awarded as a winner of the 2017 PDN Photo Annual. She instagrams a lot, has strong and hasty reactions to things a lot, gets enthusiastic and/or sentimental about things a lot, and goes jogging approximately once every two months or so. 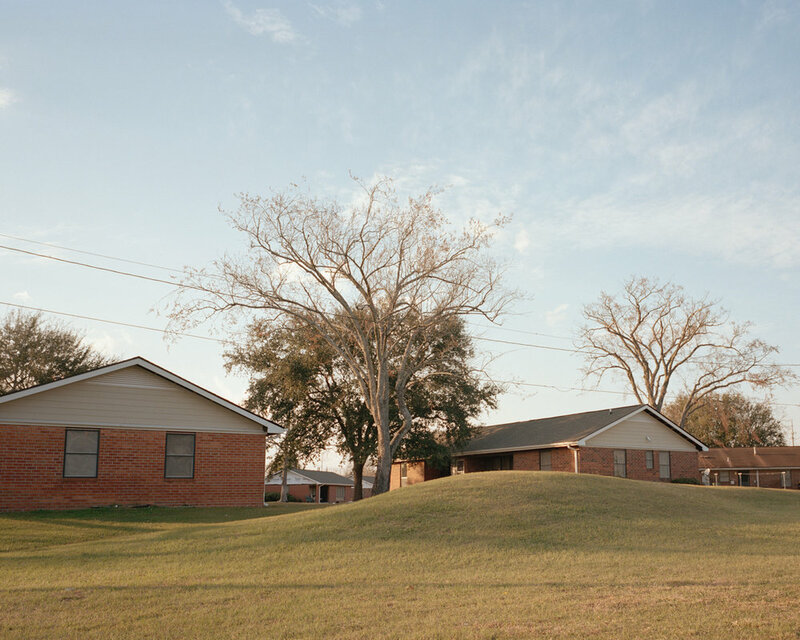 Edging, GA is an ongoing project simultaneously creating and documenting a place that doesn’t really exist. Time passes slowly here, at a speed that allows for close examinations of bugs and bones and openings, and it exists only at sunrise and sunset. Challenges are presented, obstacles overcome, hearts ache, things and people get old and die. It is of this world, but filed down to a smooth bevel, corners rounded. Though Edging is not a real place, it’s very close – more mirage than fantasy. It’s something you can really see that looks tangible from far away no matter whether you’re looking backwards or forwards, but as soon as you get close it disappears. This golden world is one of the many fictions of pages, screens and songs that are arguably all based on true stories, and they are never meant to be within reach. By the time you got there it would be dirty, you would be tired, and you still couldn’t touch your shadow or make a sunset stay. Longing, loneliness and the desire to fill our holes and gaps and close our distances is one of the most compelling forces in life, and the feeling of edging towards the fulfillment of your desire is often better than the fulfillment itself - that is assuming fulfillment itself is even possible. I don’t know yet if these are the right words for these feelings, or just some words I learned that fit the best. I don’t know if the people in my pictures are the ones who have made themselves comfortable and warm in these feelings or if they are the ones who are just as scared of them as I am. Maybe the people in my pictures are the ones who also don’t know what to call it, and also use “lonely” or some other inadequate descriptor to give it a name. Maybe, though, there is no word, and I’m getting closer to being a person who isn’t searching for it. Maybe that’s what I’m taking pictures of – people and things that are also almost there, who have almost kicked over the rock under which it has been hiding, or are almost done looking. Why Savannah College of Art and Design? I was originally attracted to SCAD for their location and structure - I didn't attend college until I was 23 and, having already moved out of home and lived overseas for a number of years, had no desire for the traditional college experience of dorm rooms full of 18 year olds who couldn't go out to the bars with me and students walking around in university logo sweatpants and sitting on a lawn that is only populated by other students, etc. SCAD was a perfect choice because it's very de-centralized but not in an enormous, distractingly busy city. There is no "quad," no real campus to speak of, just a bunch of buildings spread all over a beautiful and really manageably sized city that I can always walk or bike around, and it was easy to find myself my own apartment and meet grad students and service industry people my age. It's also 20 minutes from the beach and has great weather, and I do not do well in the cold. In terms of the program itself, when I was applying in 2013 SCAD had a 5th year Masters in Education program, which was a huge draw for me. Unfortunately they cut that program the year I was accepted, but that ended up not being an issue because by the time I was halfway through my 4 years there I realized I wanted to do my MFA somewhere else in photography, not education. SCAD also had a reputation and self-image of being a very no-nonsense, career focused art school. When I was applying I honestly didn't envision myself going into the fine arts track and wanted to explore my options in the professional world, which was exactly what SCAD presented. That also ended up being the exact opposite of what I am now graduating with, but I feel like a huge part of life is just learning what you don't want to do through process of elimination so that's fine. How has your experience at SCAD informed or shaped Edging, GA? Edging, GA would absolutely not exist without my having come to SCAD. In terms of the facilities, I shoot medium format color film and SCAD has I think 10 Imacon Flextight scanners which are expensive as hell and most schools have nowhere near that many. There are Canham 4x5's and Mamiya 7's for rent which I loved so much I ended up buying for myself. We also have a fantastic C41 color film processing team and RA4 drop-off printing which I have taken full advantage of. The professors have been wonderful for my particular area of interest as well - there is a wide range of fine art experience, they have all been super encouraging of my interest in pursuing an MFA and eventually becoming a professor myself. I was taught how to make informed decisions on what and where to submit it so that it was worth my time and money, received guidance on writing and talking about my work, and they have between them such an astounding mental catalogue of photographers that they referenced who were critical in inspiring, informing, challenging, and growing this project. They lead some great critiques, and were always willing to spend extra time going over the work with me. 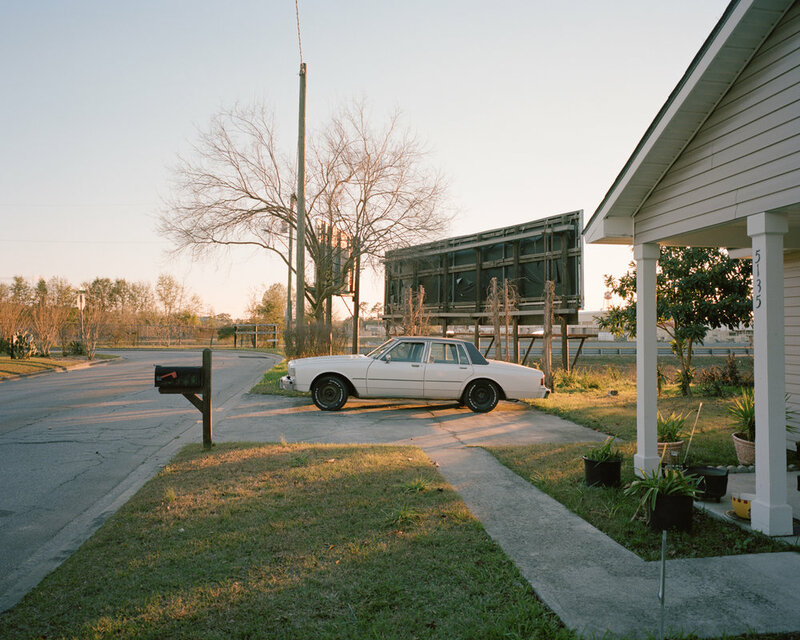 Edging is a made-up place, but it was shot entirely in and around Savannah itself, so of course being in this city has been a critical factor to the creation of the project. The slowness, the stupefyingly beautiful light that seems to only exist there, the long warm days and peach-colored sunsets, the shabby lived-in and loved-in feel of much of the city as well as the strange little ticky-tacky boxes of housing developments in the suburbs - all of this, the people, the food, everything. Every single picture in Edging is Savannah, just in my own little fictionally perfect headspace. Perhaps the most pivotal point for me though, was joining Aint-Bad. The founders were all SCAD graduates, and though a lot of our current team works remotely we are still based out of Savannah. There is not a single part of Edging that hasn't been informed by my constant exposure to the incredible artists that we feature online and in print, and by the amazing people I've had the privilege of working with at Aint-Bad. Honestly not much. Since moving here as a student I've been working in bars and restaurants and occasionally nannying, and lots of people do retail, but there are hardly any jobs here for graduates. If you can get a job with SCAD then good for you, and they definitely do employ a fair amount of graduates, but other than that I have no idea what you would do. The arts community is small but determined, and there are a fair amount of galleries for showing your work while you're here. There are also some great opportunities to volunteer in the wider Savannah community with whatever your medium may be. Not to worry about having a distinct and recognizable "style" as an artist. I stressed out about that so much at the start, trying to figure out what exactly made my work mine, what set it apart from the rest, and it caused me to make a lot of weird, forced projects. If you have a style, great. If you have a style and it changes, thats great too. If you don't have a style at all and you make whatever you feel like making, thats great as well. It was only when I let go of trying to figure out what kind of art I was making that I actually started making art I liked. What advice do you have for prospective students looking to attend SCAD? SCAD is a very young school - I think it's only in its 35th or 36th year. That means there are still a lot of shifts and changes within the programs, so being flexible is important. It is also, even within the School of Fine Arts, not focused on nitty-gritty conceptual art or art theory. It is a career focused school with a strong commercial lean. The first couple years are challenging - SCAD's drop-out rate is very high. I'm totally the wrong person to ask - my social media accounts are personal so I don't really follow my school programs! I'm sure there is an instagram and I know there is a blog as well, but I'm not sure how interesting it would be for non-students. Absolutely you should all be following Aint-Bad on instagram and facebook - we publish a new artist five days a week online, we have great magazines coming out once or twice a year, and we have been publishing monographs for some amazing artists. It's become like an encyclopedia/directory for contemporary photography for me.